The beautiful swans symbolize love, grace and purity. This large aquatic bird belongs to the family of duck and goose. Swans live in streams, rivers and wetlands across Northern and Southern hemisphere. There are seven different species of swans in the world. Their attractive feathers come in black, white, grey and orange. 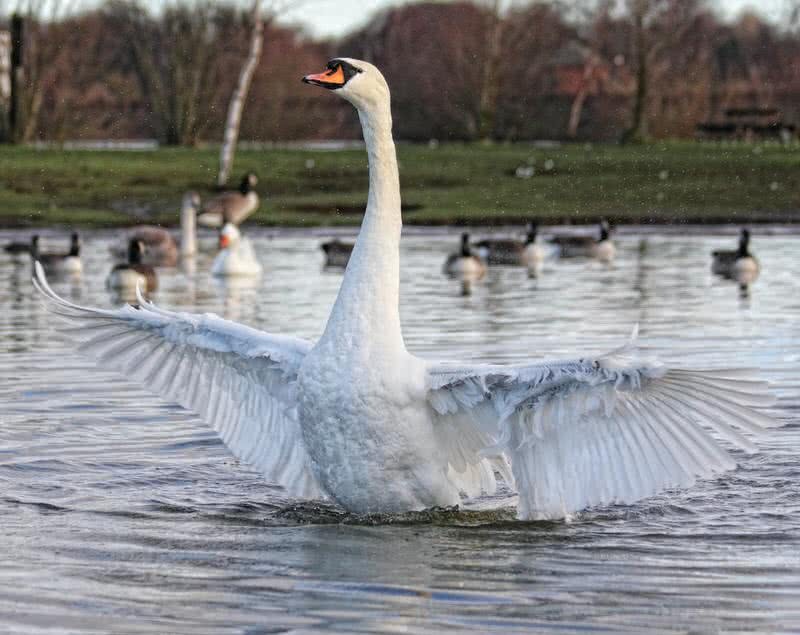 The large swans grow 35 inches to 60 inches in length and weigh up to 15 kg. Their wingspan measures between 6.6 feet and 11.5 feet, one of the largest wingspan in the family of birds. To your surprise, the cute looking swans are not so gentle. They are dangerous even to humans. Swans have very few natural predators. As you can imagine, human are the main predator. But swans only attack when they feel threatened, mainly to protect the young. With strong wings, they could quickly reach you. Then they will bite you or try to drown you if you are in the waters. The injuries caused by the swans can be severe. With serious strong bites, swans can defend the predators like raccoons and foxes. The raccoon is a cute, medium-sized mammal inhabited in wooded areas across North America. 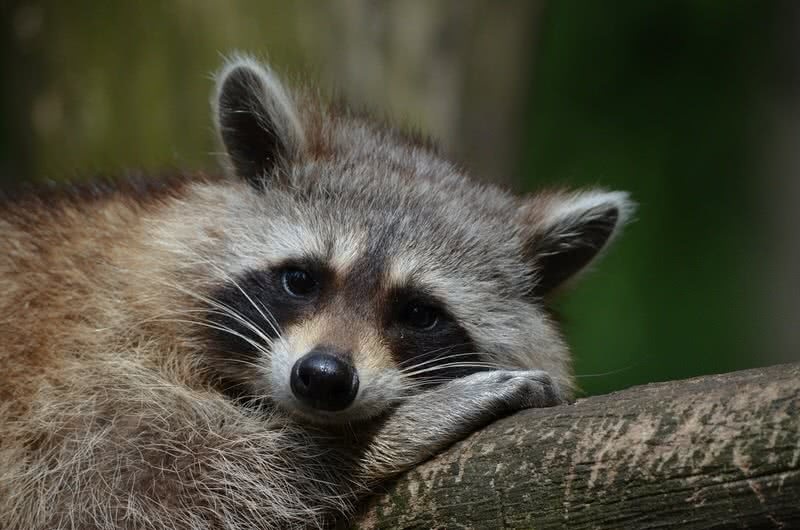 Raccoons are known for their beautiful dense, grey fur and dark facial mask. It is a nocturnal creature. They also found during daytime. Raccoons are extremely adaptable, live even in urban areas. You need to be careful, if raccoons live around your home. Because they can cause diseases and property damage. The direct attack from raccoons on humans is a rare case. But they carry dangerous rabies and roundworms. The raccoon is a very curious creature and searches everywhere to find food. This behavior leads to damage of your properties. They destroy plants and dig out garden or lawn. Raccoons also may attack your pets. This omnivorous creature that both plants and animal. Their diet includes fruits, nuts, grains, insects, rats, squirrels, frogs and small birds. The poison dart frogs are among the most colorful creatures on Earth. They live in tropical forests of Central and South America. 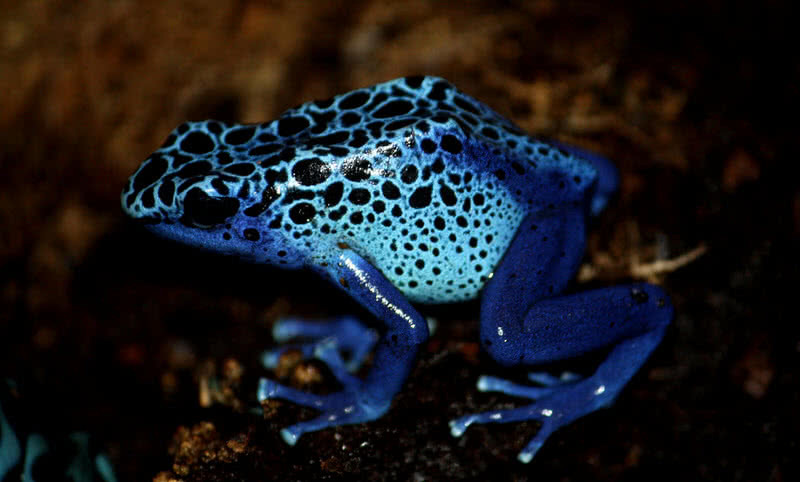 There are 100 different types of poison dart frogs in total. Depending on the habitats, they found in different colors including blue, green, black, red, yellow or gold. The striking colors of poison dart frogs are actually a warning for predators that they are poisonous. The level of poison varies on different species of poison dart frog. The most deadly one is golden poison dart frog. They have enough poison to kill a number of adult men. The tribal people of Panama and Colombia use the strong venom of poison dart frogs at the tip of their arrow for hunting. The poison dart frogs have only one natural predator called Leimadophis Epinephelus. It is a special species of snake which resist against poison dart frog venom. Cassowary is a large, flightless bird found in tropical rainforests of New Guinea and Australia. Reaching between 55 inches and 79 inches in height and up to 58 kg in weight, this amazing bird is the second largest living bird in the world. They have very long, powerful legs with sharp claws. 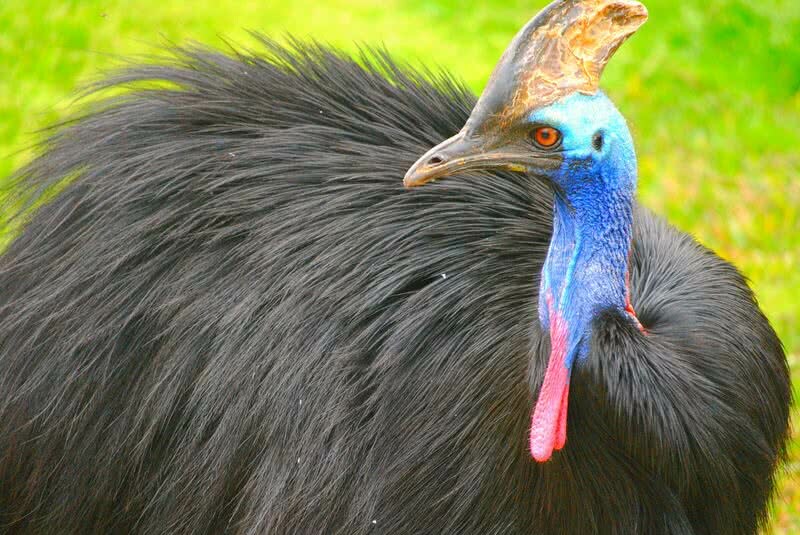 Perhaps no other living bird in the world is as dangerous as cassowary. With long, powerful legs, cassowary can easily kick down other animals or humans. They also use their long, sharp claws as a weapon to rip any potential predator into pieces. Cassowaries can hit a top speed of 31 miles per hour and jump up to a height of 1 meter. So, they can chase you down quickly. Apart from the great size, and aggressive behavior, cassowaries are known for their beautiful horn like the crest on the head. Regardless of being flightless, cassowaries are excellent swimmers. They also have excellent sense of hearing. Polar bears are one of the largest and most beautiful animals on Earth. They mainly found in the Arctic circle. Polar bears are the largest terrestrial carnivore on Earth. They can reach a body length between 7 feet and 10 feet, shoulder height of 4-4.5 feet and weigh up to 720 kg. Polar bears are well-adapted to live in the harsh, cold environment. they have very dense, water-resistant, white coat and a thick layer of body fat. 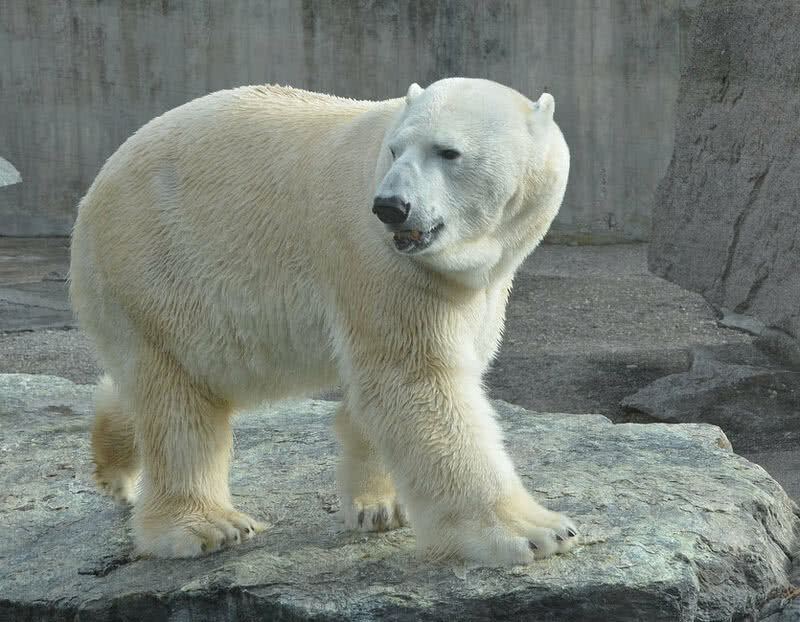 With the strong paws, polar bears can also swim in the Arctic ocean for more than 63 miles. This large predator typically feed on seals. Attack on humans are not so rare. They attack viciously if they found you as a threat. Keep in mind that with a swipe of powerful front paws, polar bears can cut the human body into pieces. Undoubtedly, chimpanzees are very cute and intelligent. This amazing animal has 95-98% same DNA as human’s. The smart chimpanzees known for using tools, learning words and communication skills. 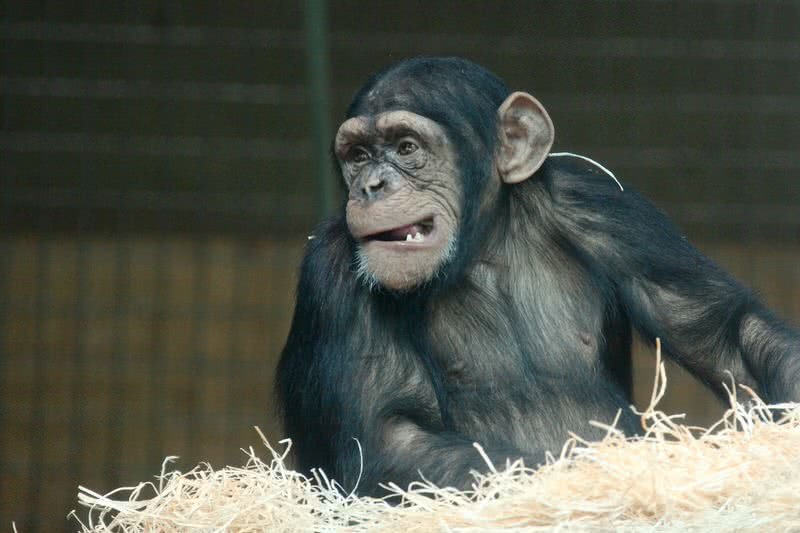 The intelligence and cuteness of chimpanzees don’t mean that they can be a good behaving pet. An adult chimpanzee almost has five times strength than an adult human. Even the captive chimpanzees can be very destructive. They bite and injuries can be very serious. Chimpanzees are the aggressive creature. It can’t be predict when they become aggressive. So, you have to be very careful on approaching them. In the wild, they fight each other to get the mate and food. Sadly, the amazing chimpanzees are an endangered species. The deforestation and hunting are the main threat to the chimpanzees. The slow loris is one of the rarest and cutest primates in the world. There are five known species of slow loris found in Southeastern Asia. It is a nocturnal primate and moves very slowly. 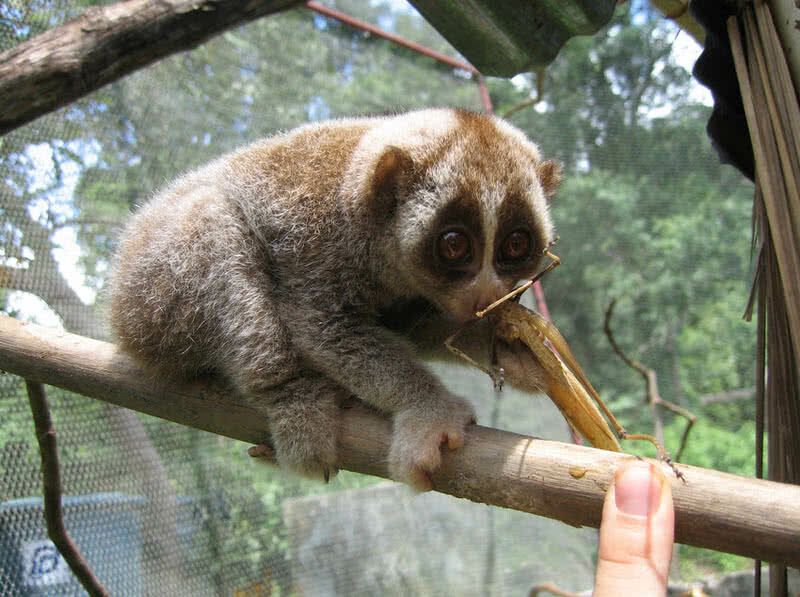 The cute slow lorises have large, front facing eyes and strong hands that give excellent grip while climbing the trees. It is a truth that slow lorises are irresistibly cute. But keep in mind that it is a poisonous creature. In fact, the only living poisonous primate on Earth. They have glands on the sides of their elbows. When slow lorises get threatened, these glands would release a foul-smelling toxic fluid. Then, this primate lick some poison from the gland and mix it with its saliva and bite the one who disturbed it. This poison could cause allergic reactions and even anaphylactic shock. Interestingly, slow lorises has cobra like pattern and movement. They also have an acute sense of smell which help them to locate the prey at night time. The cute looking blue ringed octopuses are one of the most deadliest creatures on Earth. They inhabit in the coral reefs of the Indo-Pacific ocean. Blue-ringed octopuses are very small in size, only measure 5-8 inches in length. But their venom is about 1000 times more dangerous than cyanide. As name suggests, blue-ringed octopuses have brilliant blue ringed on their yellow skin. They have sphere shaped salivary glands behind the head. It releases powerful venom when threatened or to kill the prey. 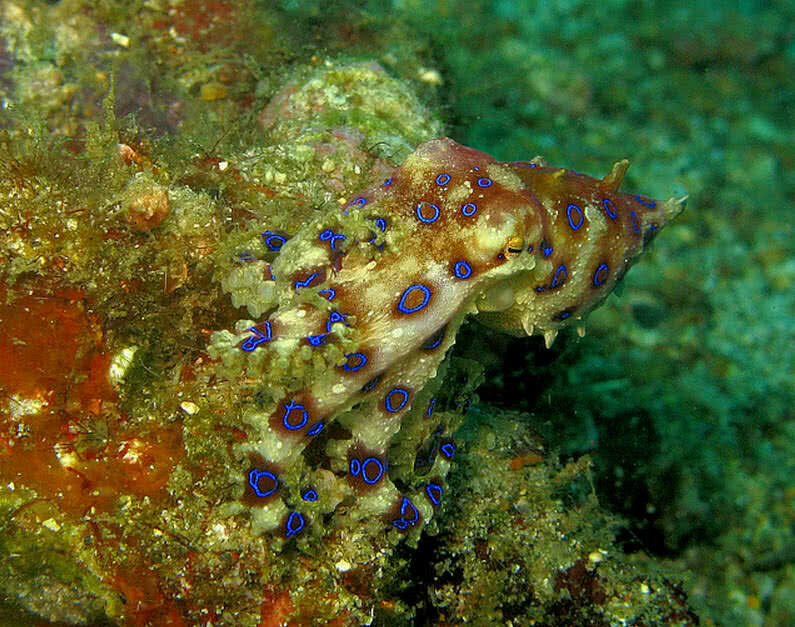 The bite from a blue-ringed octopus is not so painful. But its venom can cause nausea, heart failure, paralysis or even death. In fact, their venom is powerful enough to kill an adult human within few minutes. Also, keep in mind that there is no antidote to blue-ringed octopus’s venom. The dangerous blue-ringed octopuses are not so aggressive. They remain hidden most of time within their habitats. When threatened, octopuses flash their blue rings as a warning. If disturbed again, they would bite and deliver the powerful venom.